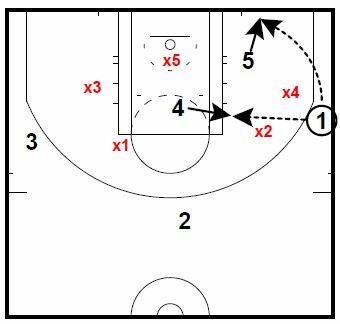 Run this play when you are inbounding the ball from under your own basket against a 2-3 zone. The 4 player will pop out to the corner for the ball. The 3 player will cut to the opposite wing. 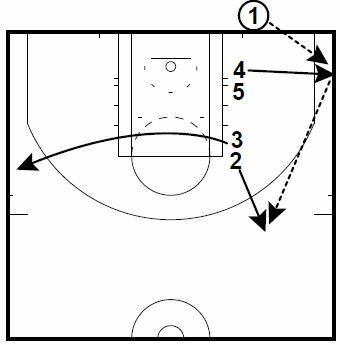 The 2 player will pop back for the pass from 4. 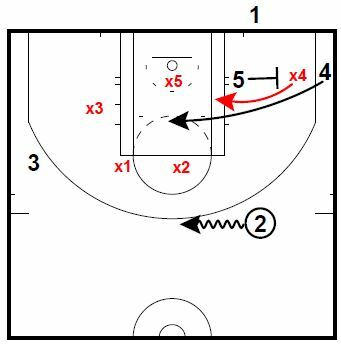 The 5 player will step out and screen the forward in the Zone, with the 4 player flashing into the middle of the paint. The X4 defender will usually fight over the screen, which sets up the play for the shooter. 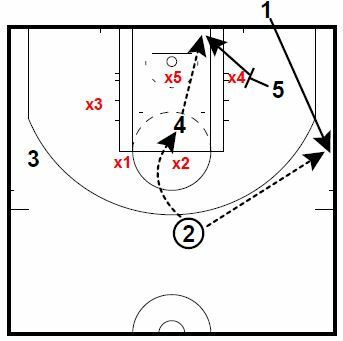 The 2 player will dribble to the key area to drag the Zone. The 5 player will re-screen the X4 defender with the 1 player coming off the screen for the shot on the wing. The 2 player can also pass it to the 4 player in the paint, which can result in a High Low Pass to the 5 player for the layup. If the shot is not available for the 1 player, you can pass it to the high post or short corner.